Through poetry and storytelling, Ọya: Something Happened on the Way to West Africa! 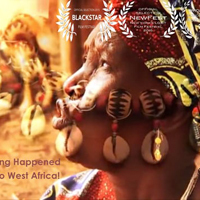 pushes the boundaries of documentary filmmaking, exploring the complex interplay of mythology, gender dynamism, history and psychology in contemporary Nigeria. Cinema verite and traditional interviewing techniques come together in a lyrical poem that reveals a rarely-seen world. Layers of images and audio resonate with truth as audiences peer into the sensuous, under-explored world of Yorùbáland ritual practice through never before seen footage. 30 minutes. Vow of Silence tells the story of Jade, a heartbroken composer who takes a vow of silence to win back the heart of Isis, her true love. In her struggle to reconnect with Isis, she meets Jaxson-an outgoing musician. Utilizing music, magic and silence-Jade finds her voice in the place she least expects it. Vow of Silence is a music-driven story, placing queer women of color at the center of the narrative. In her inability to speak-Jade communicates her pain, weakness, power and joy through music. An original score by Be Steadwell and live music narrate Jade’s journey. 28 minutes. Featuring special guests Seyi Adebanjo and Be Steadwell. Can’t make it, but want to participate? Attend from anywhere via the Google Hangout! Presented as part of My People—a series of screenings, performances, and discussions exploring the life experiences of queer people of color.